Put a pot of water on to boil. Place sliced zucchini in a large colander and set it in the sink. Cook ravioli according to package directions. Pour the ravioli and cooking liquid over the zucchini in the colander. Meanwhile, mash garlic and salt together in a small bowl with a fork to form a coarse paste. Combine half-and-half and flour in another small bowl and place near the stove. Heat butter in a large skillet over medium-high heat. Add shallot and the garlic paste and cook, stirring, until fragrant, about 1 minute. Add wine and cook, stirring, until almost completely evaporated, 2 to 3 minutes more. Add the flour mixture and cook, stirring, until the sauce is thickened, about 30 seconds. 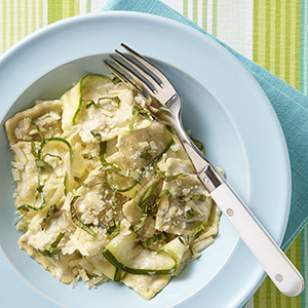 Gently stir in the ravioli and zucchini, basil and pepper. Divide among 4 plates. Top each portion with 1 tablespoon Parmesan. Per serving: 351 calories; 11 g fat (6 g sat, 2 g mono); 53 mg cholesterol; 48 g carbohydrates; 0 g added sugars; 14 g protein; 2 g fiber; 541 mg sodium; 345 mg potassium. Nutrition Bonus: Vitamin C (32% daily value), Calcium (28% dv).